Do you love Boos? This flask is perfect for keeping spirits of all kinds, for Halloween or any occasion for those who live on the spooky side. Drink with style... Custom art on a stainless steel hip flask. How cool is that? Created by the artists, Trixie & Milo. These flasks are slim enough to fit in your hip pocket or purse, and stylish enough to show to all your friends! Makes an awesome gift for weddings, bridesmaids, groomsmen, or just birthdays, anniversaries, or the holidays. A perfect fashion accessory! Do you love Boos? 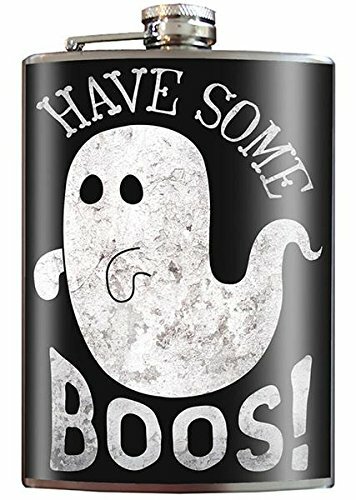 This flask is perfect for keeping spirits of all kinds, for Halloween or any occasion for those who live on the spooky side. 100% lead-free, food-grade stainless steel. Label is printed on water-and-alcohol-proof vinyl: easy to clean! Ships in a vintage-style gift box, perfect for wrapping and ready to gift. If you have any questions about this product by Trixie and Milo, contact us by completing and submitting the form below. If you are looking for a specif part number, please include it with your message.